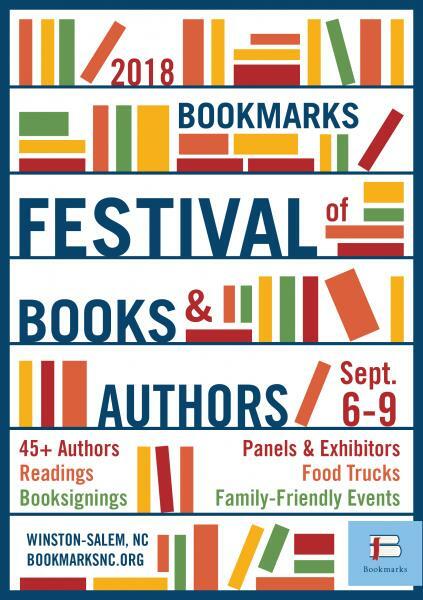 The North Carolina Writers’ Network will have an exhibitor’s booth at the 2018 Bookmarks Festival of Books and Authors this Saturday, September 8, in downtown Winston-Salem. Come by and say hello! We’ll be sponsoring two sessions of Slush Pile Live!, an interactive event for aspiring writers to get immediate feedback on their work from editors and agents. All anonymous—all live! Want to have your work read? Bring a hard copy of up to 300 words of prose from a single work, typed, double-spaced (with no name) to the Info Booth by 9:30 am for the 10:00 am program or by 3:30 pm for the 4:00 pm program. Submissions chosen at random. Not all guaranteed to be read due to time limits. New to Bookmarks this year is a Scavenger Hunt where attendees can check-off items by visiting exhibitor booths and displays. If they turn their completed check-list in by 5:00 pm, they’ll be entered in a drawing. There will be ten winners! Pick up an entry form at the Info Booth or at Bookmarks brick and mortar location in Winston-Salem. This year’s lineup includes longtime NCWN members and friends of the Newtork Carole Boston Weatherford, who’ll read and sign her new book Dorothea Lange: The Photographer Who Found the Faces of the Depression; fiction writers Silas House, Charlie Lovett, Rebecca Makkai, Elaine Neil Orr, and Michel Stone; nonfiction author and NCWN trustee Georgann Eubanks; and many more. For full festival details, click here. This is one of our favorite weekends of the year. See you there! This was written by charles. Posted on Wednesday, September 5, 2018, at 10:30 am. Filed under Uncategorized. Tagged bookmarks, Carole Boston Weatherford, charlie lovett, Elaine Neil Orr, exhibitors, georgann eubanks, Rebecca Makkai, Silas House. Bookmark the permalink. Follow comments here with the RSS feed. Both comments and trackbacks are currently closed.